How to Save Money Like My Parents — How Do You C.U. It’s taken just over three decades for me to realize it, but my parents are pretty cool. My mom, Bonnie is a fiery-haired retired teacher who taught Science, PE and a litany of other subjects for over 30 years. My dad, Bob is a retired 35-year plumber who helped with the construction of the Shedd Aquarium, Lincoln Park Zoo and myriad of other plumbing projects in and around Chicago. My mom and dad built the home that my twin sister and I grew up in, and most recently they added a second floor to their retirement home at the Lake of the Ozarks. They are hardworking, generous and honest. My parents are also expert finance managers. I have distinct memories of my mom and dad discussing (and sometimes bickering about) money. To Bonnie and Bob, keeping a tidy home was just as important as keeping their finances organized and in check. Only now that I am in my mid-thirties, do I realize what a monumental test of will it must have been for my parents to save money and thrive on a modest income—all while raising two twin girls. I often find myself wondering…just how did they do it? So, I decided to ask them. How were you able to save money with two kids? 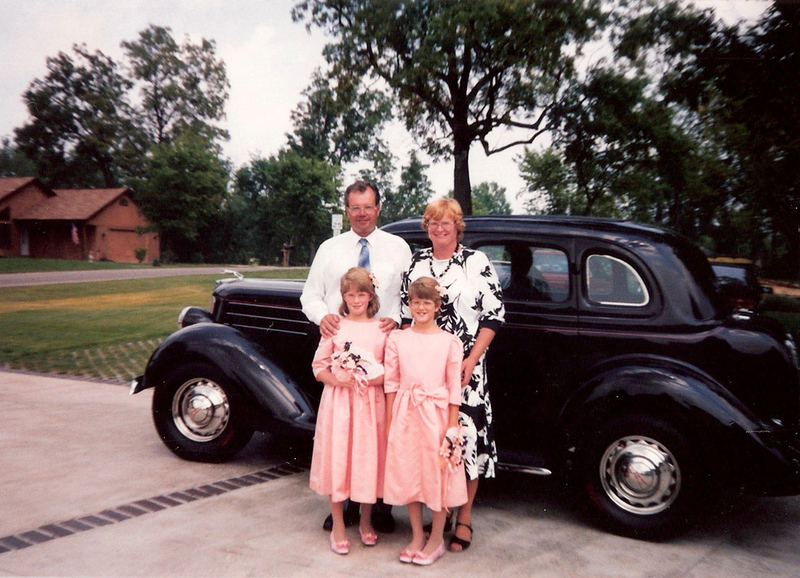 My dad (Bob), mom (Bonnie) me (Beth) and twin sister (Sue) circa 1990 standing in front of the 1936 Ford he restored when he was a teenager. MOM: I joined a “Twins Club.” This was a place for families with twins to connect and buy/sell things like used jackets, cribs, twin strollers, etc. Your cribs and changing tables were borrowed from friends and relatives, and for diapers we cut coupons. DAD: We only spent money on essentials. At the time, I would go to Phar-more discount store for baby formula, snacks, and beer to drink…at HOME. How often did you go out to eat or order in when you were my age? MOM: We did not go out to eat very much. Sometimes as a treat we would order pizza on Friday nights, but that’s about it for “going out.” Your grandparents cooked for us once a week, and in exchange, your dad would fix their cars. DAD: Like your mom said, we didn’t really go out much. Cable TV was pretty new, and because we were so busy, that was our entertainment. How much of your paycheck did you try to save every month? MOM: I would take my check and deposit it immediately. For spending money, I would withdraw a set amount of cash, and this would have to last me through the end of the month. As you got older and further along in your career, how did your perspective on saving money change? MOM: Costs went up as you and your sister got older. We wanted you and your sister to go to a good school, but couldn’t afford private school outright. I accepted a job at a private school making less money, but you and your sister were able to attend for free. DAD: It really didn’t change much. Money just went to different (more expensive) things, like: college books, college phone, college cars…everything COLLEGE. Do you think Millennials will be able to retire? MOM: I do. Pension plans are not as good for you as they were for us…young people will have to save more, but they also will make more. Hopefully Social Security will stay funded. DAD: Yes, but you will need to work at that goal. Like mom said, pensions today aren’t what they were for us. Put money aside and you will be able to reach your goal of retirement. If you could give any piece of financial advice for people my age or younger, what would it be? MOM: We built a home, remodeled two others and sold them to help pay for college. We used "sweat equity" to do this. We went to work every day, worked to do our best and we knew the difference between wants and needs. Take care of your needs—not your wants. DAD: Use the Bohemian down payment plan: 100% down, nothing more per month as often as you can. 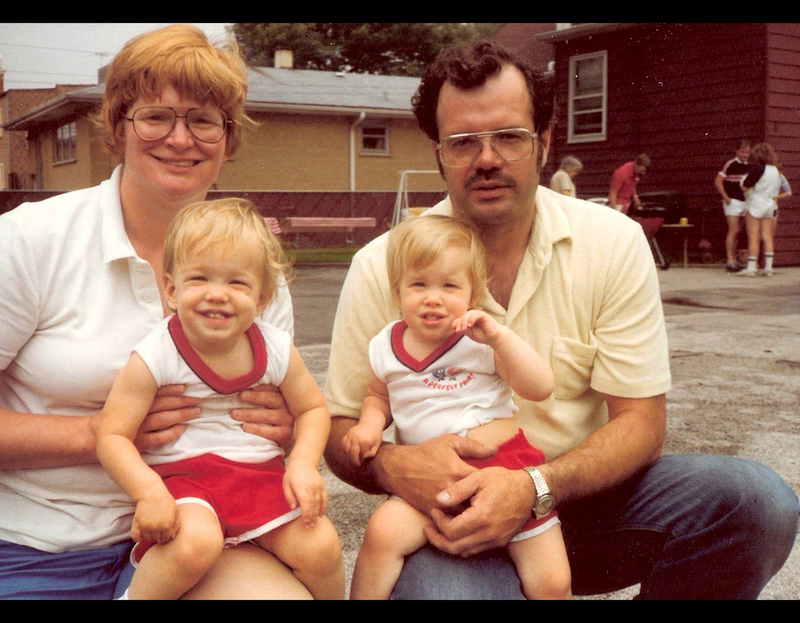 Bonnie, Sue, Beth and Bob in the early 80s. What are some favorite money-saving tips you have picked up from your parents? Share yours with us in the comments!